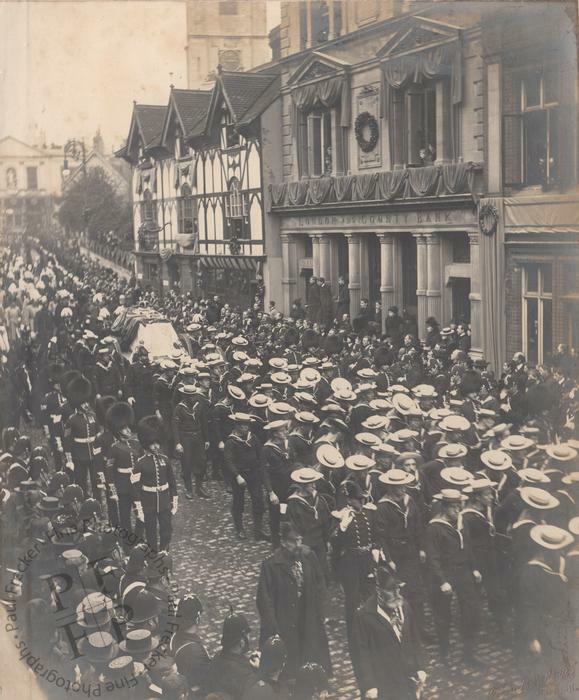 A large silver print showing Queen Victoria’s funeral cortège as it passed through Windsor. A pencilled inscription recto in the lower margin reads: ‘Funeral procession of Queen Victoria at Windsor. Bluejackets of “Excellent” drawing the gun carriage, Febr. 4th, 1901.’ In fact, this incident involving the naval detachment took place on the way to Windsor Castle, on Saturday 2 February, not on the 4th. According to a report in The Times (4 February 1901): ‘At this moment an unfortunate incident marred, for a time, the progress of the cortège. The artillery horses, which for some reason had become rather restless, had only moved a few paces forward when one of them reared and plunged in an exceedingly dangerous manner in front of the gun carriage, behind which the King, the German Emperor, and the Duke of Connaught were walking. All attempts to pacify the animal were altogether unavailing; and at last, as the procession was being seriously delayed, the entire team was removed and their places were taken by a large number of the bluejackets who formed the naval guard of honour. With their ever ready handiness, they turned the traces and chains of the harness into draw ropes, fitted them to the gun-carriage, and themselves drew it with its precious burden from the station to the chapel. Queen Alexandra, and the Princesses of the Royal Family, all of whom were in deep mourning, had previously driven to the St George’s Chapel direct. Photographed by Bender and Lewis of Croydon, identified by their blindstamp recto in the lower right-hand corner. Condition: the print presents some foxing in the area of the sky (upper left-hand corner) but is otherwise in excellent condition, with good tonal range. The album page on which it is mounted presents a small amount of foxing verso but is otherwise also in excellent condition. Dimensions: the print measures 11.1” by 8.8’ (28.3 cm by 22.4 cm); the album page on which it is mounted is just a fraction larger.